Dorzox Eye Drops (Dorzolamide) is a type of carbonic anhydrase inhibitor, used to treat glaucoma and ocular hypertension. It is applied to the eye, and is used to reduce the production of aqueous humour (fluid in the eye). 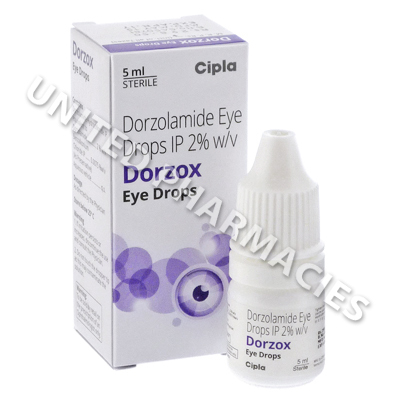 Dorzox Eye Drops (Dorzolamide) is a type of carbonic anhydrase inhibitor, used to treat glaucoma and ocular hypertension. It is applied to the eye, and is used to reduce the production of aqueous humour (fluid in the eye). Too much fluid in the eyes can cause an increase in pressure, which may lead to eye damage or blindness. Reducing the amount of fluid in the eye leads to a reduction in pressure, thereby helping to prevent damage to the eyes. Dorzox Eye Drops (Dorzolamide) need to be applied directly into the eye or eyes that are affected and require treatment. However, before you use it, it is necessary to consult your doctor, so that the correct dosage can be prescribed. Your doctor will examine you, and determine the dosage based on the severity of your condition. Patients are normally told to apply one drop to the affected eye or eyes 3 times per day. Replace the dropper immediately, and do not rinse it. It is also essential that you do not allow it to become contaminated. You must tell your doctor about all side effects that occur. This is important, especially if any of the reactions listed above become bothersome. In addition to the aforementioned side effects, there is a slight risk of more severe adverse reactions associated with use of these eye drops. You must consult your doctor immediately if you notice itchy eyes, redness affecting the eyes, eye inflammation, watery eyes, dry eyes or any other reactions. If you suffer from or have a history of kidney disease, it is necessary to inform your doctor before you begin using these eye drops. If your doctor has prescribed other topical medications to you, it is likely that you will be told to apply them either 10 minutes before or after you apply these eye drops. Always use Dorzox Eye Drops (Dorzolamide) as you have been prescribed by your doctor. Never self-medicate or change your dosage without first consulting your doctor. The correct dosage can vary depending on your health, medical history, and the severity of the condition being treated.